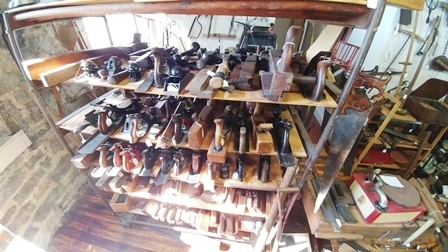 I will list here some edge tools I have for sale. Whenever possible, I'll link a photo. I can always send you a pic of one of the tools I have not posted a pic for. so it might take a few days before I can go get them. If you have questions, you can e-mail me at toolman@gatctools.com. I am always open to counter-offers. Note: Shipping will depend on size and weight. USPS Flat Rate boxes work well for smaller items. I will send you an invoice of the total cost. Walt Lane, 3 Pewter Lane, Johnstown, NY 12095. Ron Herman is a real master with chisels. They have been used well by former owners, and each has a full life yet to give to you at your bench. Final honing is up to you. 23BC-5 - Chisel, 3/8", Defiance by Stanley, in Good+ condition. noting some pitting starting 4 inches above the cutting edge. 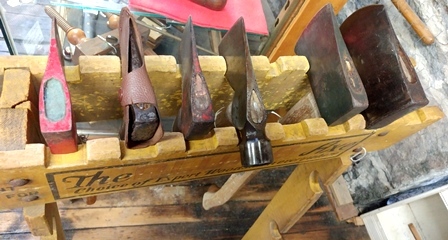 Will not affect use for many sharpenings. 23BC-3	- Chisel, Bevel Edge 1 1/4", marked T.H. Witherby, in Good+ condition. 7W117 - Chisel, Firmer 1 1/2", marked P.S.&W., in Good + condition. 7W311 - Chisel, Framing, 7/8" by T. H. Witherby, in Good+ condition. noting some light pitting over most of the tool. 7W962 - Chisel, Framing, 2" by Merrill Co., in Good+ condition. 7W991 - Chisel, Everlasting No. 40, 1", by Stanley R&L, in Good+ condition. 7W991 - Chisel, Everlasting No. 40, 7/8", by Stanley R&L, in Good+ condition. 7W991 - Chisel, Everlasting No. 40, 3/4", by Stanley R&L, in Good+ condition. Got em today. They look great. Thank you! I'll definitely be ordering from you again. Cheers,Matt R.
15RY - Chisel, Sash Mortise 1/8", by Crescent (Scotland), in Good+ condition. 33CC-4 - Chisel, Sash Mortise 1/8", marked Woodriff & Ward, in Good+ condition. 23BC-8 - Chisel, Sash Mortice, 1/8", by P. Merrill & Co., in Good+ condition. 13MG - Gouge (tang), 1/2" X 7", in-cannel, by Hearnshaw, Sheffield, in Good+ condition. 15RN - Gouge, socket, 1/2" X 8 1/2", out-cannel, by TH Witherby, in Good+ condition. 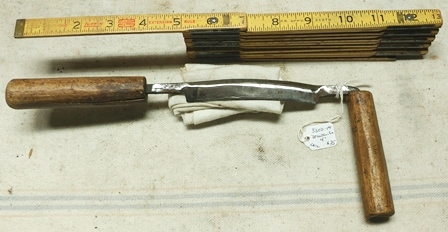 9W642 - Gouge, (tang), 1 1/2" out-cannel, by Buck Bros. w/original handle, in Good+ condition. 9W643 - Gouge, (tang), 1 1/4" out-cannel, by Buck Bros w/original handle, in G00d+ condition. 9W644 - Carving Tool, #14, by Buck Bros w/original handle, in Good+ condition. 9W645 - Carving Tool, #17, by Buck Bros w/original handle. in Good+ condition. with minor pitting on both sides. 33CD-1 - Drawknife, 8", unmarked by maker, in Good condition. 33CD-4 - Drawknife, 10", unmarked by maker, in Good condition. 33CD-6 - Drawknife, 4", unmarked by maker, in Good+ condition. 33CD-11 - Drawknife, 12", by Stones, in Good+ condition. 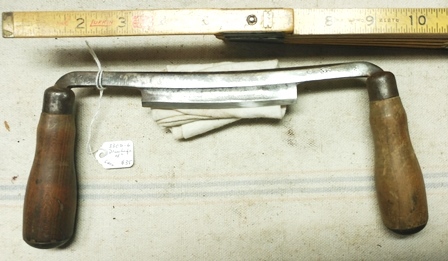 33CD-12 - Drawknife, 10", by E.&I. White, in Good+ condition. 33CD-14 - Drawknife, 4" curved, unmarked by maker, in Good condition. 33CD-15 - Drawknife, 7" curved, by Part Mfg. Co., in Good condition. 19K=12 - Drawknife, 7", Appears smithy-made from file, in Good condition. 7W491 - Drawknife, 8", by Fowler, St. John, NB, in extra Good+ condition. 7W1166 - Drawknife, Folding, 8", by Fulton (Pat. 2-20-06), in extra Good+ condition. 9W604 - Hatchet, Camp, unmarked by maker, in Good+ condition. 7W215 - Carpenter Adxe, 4 1/2", by Morris, Little Falls, in Good+ condition. noting that this adze will need the handle replaced soon. 7W308 - Screw Turn (made from file), very well made, marked 1871, with nice handle. to suit the needs of both tradesman and collector. If you don't find what you need on this page, send an e-mail. We'll do our best to help you find that tool. Three tool dealers at this site.